Personalized Home Address Sign with Golfer - - custom made golfer's address plaque. Unique enhanced rectangle golf sign features a female golfer, male golfer, or a male and female. Made in USA. One-line sign. Wall mount. Big 3.5" numbers. Customized with your choice of style, color, and address numbers you specify. Two sizes: 12"W x 6"H x 1/8" and 16"W x 8"H x 1/8". 12" x 6" sign holds three (3) 3.5" numbers. 16" x 8" sign holds four (4) 3.5" numbers. Border is the same color as the personalization and accentuates the unique rectangular shape. 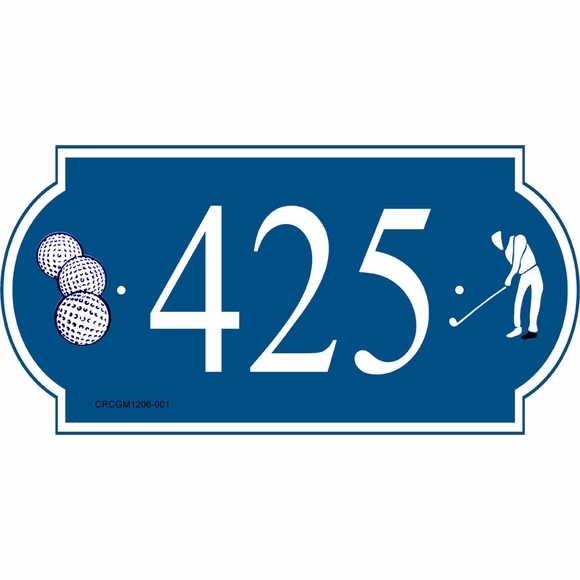 Laminated acrylic golfing address plaque crafted in the USA by skilled artisans to assure the highest quality.